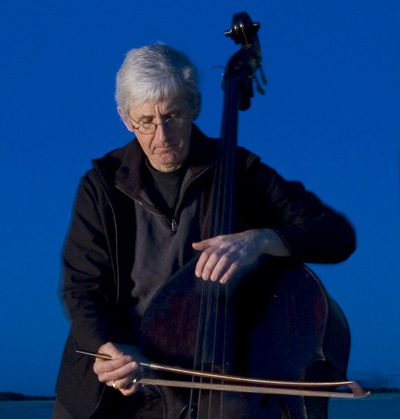 Mark Dresser is an internationally acclaimed bass player, improviser, composer, and interdisciplinary collaborator. Since 2006 he has been researching, performing, composing, and collaborating in the field of telematic performance, which explores the musical, technical, and social dimensions of live performance between multiple locations through high speed Internet. He was a co-coordinator, composer, performer, and conductor of Deep Tones for Peace, a 2009 Internet performance including thirteen internationally bassists collaborating live between Jerusalem and New York City. Collaboration is central to Dresser's artistic activities. Currently he composes, performs, records, and tours with the collective Trio M featuring pianist Myra Melford and drummer Matt Wilson. Their CD Big Picture (Cryptogramophone) was ranked by several jazz critics as one of the "Best of 2007." Dresser also collaborates with the trio Mauger featuring the celebrated alto saxophonist Rudresh Mahanthappa and veteran drummer Gerry Hemingway. Together they recorded the 2008 CD The Beautiful Enabler (Clean Feed). Jones Jones is yet another active cooperative trio that performs solely improvised music and includes Larry Ochs from the saxophone quartet Rova and Russian percussionist Vladimir Tarasov. Their most recent CD is We All Feel the Same Way (SoLyd Records, 2009). Interdisciplinary collaboration is a particular area of artistic interest. He has collaborated with and composed for Sarah Jane Lapp's films, Chronicles of an Asthmatic Stripper (2002) and Bedtime Story (2008). In 2007 they received a joint fellowship to the Rockefeller Foundation's Bellagio Center to create music for the animated film Chronicles of a Professional Eulogist (2008) which is currently being shown as part of Reinventing Ritual: Contemporary Art and Design for Jewish Life at the Jewish Museum in New York City. Dresser was also commissioned by sculptor Robert Taplin in 2004 to compose solo works which were performed at the opening of Taplin's exhibit The Five Outer Planets and included in the catalogue as a recording. Additionally, Dresser has collaborated with digital artist Tom Leeser in the video works Subtonium and Sonomatopoeia, video scores for live performances involving interaction between musicians and audiences. His distinctive sound is documented in more than one hundred recordings with John Zorn, Ray Anderson, Jane Ira Bloom, Tim Berne, Gerry Hemingway, Anthony Davis, Dave Douglas, Satoko Fujii, Bob Ostertag, Joe Lovan, and many others. Nearly thirty of these CDs are as a soloist, bandleader, or co-leader during his eighteen years living in New York City (1986-2004). From 1985 to 1994, he was a member of MacArthur Award recipient Anthony Braxton's Quartet, which recorded nine CDs and was the subject of Graham Locke's book Forces in Motion (Da Capo). Dresser has composed music for the silent films The Cabinet of Dr. Caligari and Un Chien Andalou, as well as music for various chamber groups including his own trio, quartet, and quintet. He was a founding member of the string trio, Arcado, with violinist Mark Feldman and cellists Hank Roberts, followed by Ernst Reijseger. Between 1989 and 1995 Arcado recorded five CDs including For Three Strings and Orchestra (Winter and Winter) commissioned by Westdeutsche Rundfunk of Cologne, Germany. Members of Arcado were also commissioned by the Banlieu Bleues Festival of France to compose for the Double Trio, a collaboration with the French Trio du Clarinettes that was recorded on Green Dolphy Street (ENJA) Other commissions include a McKim Fund commission at the Library of Congress for Air to Mir (Marinade-Tzadik) for violin and piano. The Swiss flute virtuoso Matthias Ziegler commissioned "Banquet" for multiple flutes, bass, and string quartet, included on the CD Banquet (Tzadik). Dresser received both B.A. and M.A. degrees from the University of California, San Diego where he studied with the seminal contrabass soloist, Professor Bertram Turetzky. In 1983, he received a Fulbright Fellowship to study in Italy with Maestro Franco Petracchi. He has been awarded two New York Foundation for the Arts grants, Meet the Composer commissions, and fellowships to the MacDowell Colony and Civitella Ranieri. He is on the board of the International Society of Bassists, the International Society of Improvised Music, and the advisory board of the Deep Listening Institute. He has been a lecturer at Princeton University, faculty at the New School University, and Hampshire College. In fall of 2004, Dresser joined the faculty of University of California, San Diego.